On this page you can find some Java games which can be played online. Several of these games are demonstration versions of KDE games. NOTE: The games on this site are moved over to Android apps. Please see http://android.sbcomputing.de/ since current versions (2014-2018) of web browsers and of the Java plugin do not allow the playback of unsigned or self-signed Java Applets anymore. This is a Java version of the game Skat which can be played online on this webpage. You can choose between various interactive and demo versions by clicking on one of the links below. This is a Java version of the KDE game Lieutnant Skat which can be played online on this webpage. You can choose between various interactive and demo versions by clicking on one of the links below. 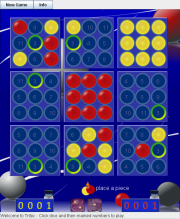 This is a Java version of the KDE game Tritoc which can be played online on this webpage. You can choose between various interactive and demo versions by clicking on one of the links below. 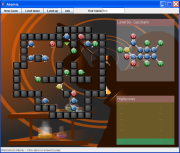 This is a Java version of the KDE game KAtomic which can be played online on this webpage. This is a Java version of the KDE game KLines and my KDE game Quintalign which can be played online on this webpage. The main difference between the games are the joker pieces in Quintalign. This is a Java version of the KDE game KDiamond which can be played online on this webpage.